Associate professor of English Brian Roberts discusses his recently published sourcebook Indonesian Notebook (co-written and co-edited with Keith Foulcher) and how it provides a necessary Indonesian perspective in postcolonial studies. 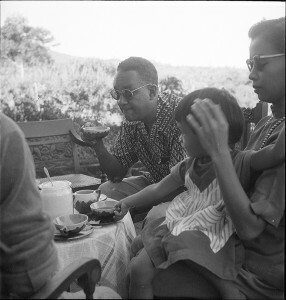 Photo of Wright at a 1955 gathering of Indonesian writers and intellectuals. Photographer unknown. Courtesy of the Beinecke Rare Book and Manuscript Library, Yale University. PROVO, Utah (May 25, 2016)—Associate English professor Brian Roberts’ interest in Indonesia was first sparked while living there as a teenager. Though a professor of American literature, Roberts’ most recent publication, Indonesian Notebook, largely strays from the typical American voices of his field and examines the historic 1955 Bandung Conference from the perspectives of Indonesian onlookers. The genesis of Roberts’ book stems from the famous African-American writer Richard Wright’s three-week visit to the 1955 Bandung Conference in Indonesia. Roberts’ book, however, is less interested in what Wright has to say about Indonesia and the Bandung Conference, and instead focuses on the writings of the Indonesian authors, intellectuals and artists who hosted Wright and interacted with him during his visit to Indonesia. Roberts teamed up with Keith Foulcher, honorary associate and former coordinator of the Indonesian Studies program at the University of Sydney, to collect, translate and introduce the sources both have collected over the course of their respective research, resulting in a comprehensive and insightful collection of essays written by Indonesians about Wright’s 1955 trip to Indonesia. Roberts explained that the Bandung Conference was a week-long gathering, held in April 1955, of 29 newly independent postcolonial Asian and African countries. In the history of the postcolonial world, Roberts said that the Bandung Conference was truly a watershed moment. The Bandung Conference also contributed to the rise of the Non-aligned Movement, which was founded later in 1961. This movement drew on what is now known as the Spirit of Bandung, which Roberts explained is the anti-colonial, non-aligned spirit that permeates third-world nationalism and solidarity, and which is also a motivating energy within postcolonial studies. The book is comprised of three parts: the first section addresses the transnational crosscurrents between Indonesian writers and Richard Wright before Wright arrived in Indonesia; the second section provides documents related to Wright and the Bandung Conference – including the remarkable archival discovery of a lecture presented by Wright in Jakarta after the conference concluded; and the final section is made up of several essays written by Indonesian writers after Wright left Indonesia, including a detailed retrospective account of Wright’s visit as recalled by the Dutch-Indonesian author Elizabeth (Beb) Vuyk. Roberts said that Vuyk’s essay in particular works well in juxtaposition with Wright’s narrative of his Indonesian travels in his book entitled The Color Curtain. “To some, it may sound like I went down a rabbit hole looking at one of Richard Wright’s minor books written about a conference that a lot of people haven’t heard about,” Roberts said. Yet Roberts said that the conference and what occurred there has become a mythic moment in postcolonial studies. “The Color Curtain winds up having its own mythology built up around it, where people who mythologize the Bandung Conference will turn to Richard Wright’s The Color Curtain for a first-hand account of that conference,” he said. The purpose of Roberts’ and Foulcher’s sourcebook is to offer a complement and in some cases a corrective to The Color Curtain, shedding light on a set of postcolonial intellectuals that were living in Indonesia and commenting on postcolonial politics while the conference was taking place – adding a much needed Indonesian perspective on this watershed moment in postcolonial studies. “Richard Wright was a postcolonial intellectual to a meaningful extent, but he was also very much a person of Euro-America, and so it winds up being curious the degree to which The Color Curtain comes to be regarded as a trusted text, a standard narrative of the conference,” Roberts said. Sylvia Cutler covers the Department of English. She is a senior pursuing a double major in English and French with a minor in women’s studies.